We have specialized in manufacturing & offering a broad range of nickel plated brass cable glands which is made of superior quality brass materials with nickel plating. These glands are suitable for all indoor as well as outdoor applications and can sustain all weather conditions. 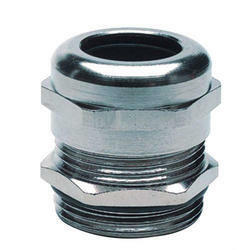 We offer a wide range of Nickel Plated Brass Cable Gland with Pg Thread for Unarmored. These are used in Outdoor & Indoor applications and in all breaded unarmored cable fittings. Offered in sizes from PG - 7 to PG – 48, these are available in nickel-plated finish. Looking for Nickle Plated Brass Cable Gland ?